This martial art began in Japan in the 1940s and is steeped in tradition and history. Morihei Ueshiba was born in Japan on December 14, 1883 and is the founder of Aikido. Ueshiba witnessed his father being attacked by local thugs growing up in modern Japan. To seek revenge for his father he decided to become strong. This strong willed youth devoted every possible moment to the martial arts and physical training. Although he received certificates in jujitsu, spear fighting, and fencing he was still not satisfied with his skill level. While he continued to pursue the martial arts he also began a study of religion in the hope that it would give his life greater significance. Aikido is the combination of Ueshibas pursuit of both the martial arts and religion. The name was changed from aikibudo to Aikido in 1942. This style of martial art incorporated many different techniques, including jujitsu, sword fighting, and spear fighting. This martial art is based on harmony and religion. Ueshiba created a very effective martial art which made use of weight manipulation, throws, and joint locks. 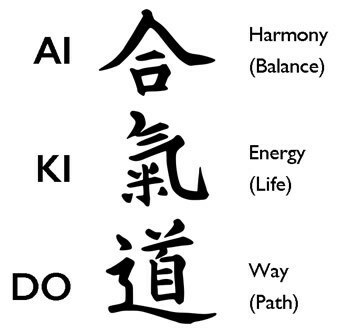 Aikido is full of the creative innovation of Ueshiba and many well thought out techniques. Aikido does not really include a unified belief or philosophy. It uses religion to inspire a belief in harmony and peace of spirit. 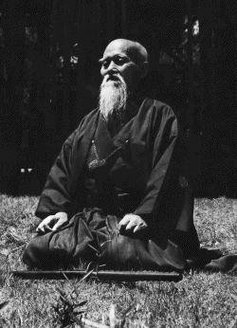 Ueshiba believed that the body can do anything when connected to a higher spiritual power. Aikido was about reconciling the world and bringing peace to all human beings, even though it was developed to get revenge for his father. Aikido has been thoroughly embraced in the United States. The study of Aikido will teach you harmony of spirit in addition to self defense. Ronin: Means to have no master. In the feudal time of Japan if a Samurai’s lord were to die he would be “Ronin”. Some times the Ronin were Rogues and brigands and roam the country doing harm, but they could also be Robin Hood type and defend the weak. For the Club “Ronin” simply means that you take orders from yourself, you are your own master. Bushido: Is a Code of seven virtues that the Samurai lived or died by.